As Mike Simmons says in the introduction to this book: “The history of geoscience is marked by the work of exemplary scientists, who through their endeavours, changed the way we think about the Earth, its history, processes and resources.” Having discovered that no one had attempted to collate the life stories of such scientists, Mike decided to compile a collection of short biographies – and this eminently readable and fascinating book is the result. Mike selected 36 eminent scientists to represent the many people who have influenced the earth sciences, and in telling their stories, starting with Nicolas Steno in the mid-17th century and ending with several geologists still with us today, he also takes us on a journey through the development of thinking and ideas in geology. There were the ongoing tussles throughout the 18th and 19th centuries between those who believed in a creationist 6,000-year-old Earth and those who realised that much deeper time was needed to explain most geological phenomena. There were verbal battles and spats between those who believed in Uniformitarianism, such as Hutton and Lyell, and advocates of Catastrophism, proposed by Cuvier and others. In later years, similar ideological arguments centred on Wegener’s theory of continental drift, which led to the concept of plate tectonics, as shown by the maps of seafloor spreading produced by Marie Tharp. She is one of only four women included in the book, since for many years geology was not considered a suitable subject for females to study. Other ideas, such as James Dwight Dana’s synclinal theory, may now be largely disproved and forgotten, but they played their part in the progression of the science of geology. We hear about brilliant lecturer Adam Sedgwick (his dictum “I cannot promise to teach you all geology; I can only fire your imaginations” clearly worked for one of his students, a certain Charles Darwin), who had a long running battle with his equally eminent erstwhile friend, Roderick Murchison, about the boundary between the Silurian and the Cambrian. This was ultimately solved by Charles Lapworth with the introduction of the Ordovician. Two men, Ben Peach and John Horne, have their stories told together, because their work unravelling the complex geology of the Scottish Highlands, and thus the theory of thrust tectonics, was so intertwined. There are well known names in the story of geology: William Smith, the maker of the first geological map of England and Wales; Mary Anning, fossil-hunter extraordinaire; and Peter Vail, who was instrumental in the development of the theory of sequence stratigraphy. Others are, to me at least, less well known – Henry Sorby, Alexander Karpinsky and Maureen Raymo, for example – but Mike very succinctly identifies the significance of each person and their work in the development of the earth sciences. 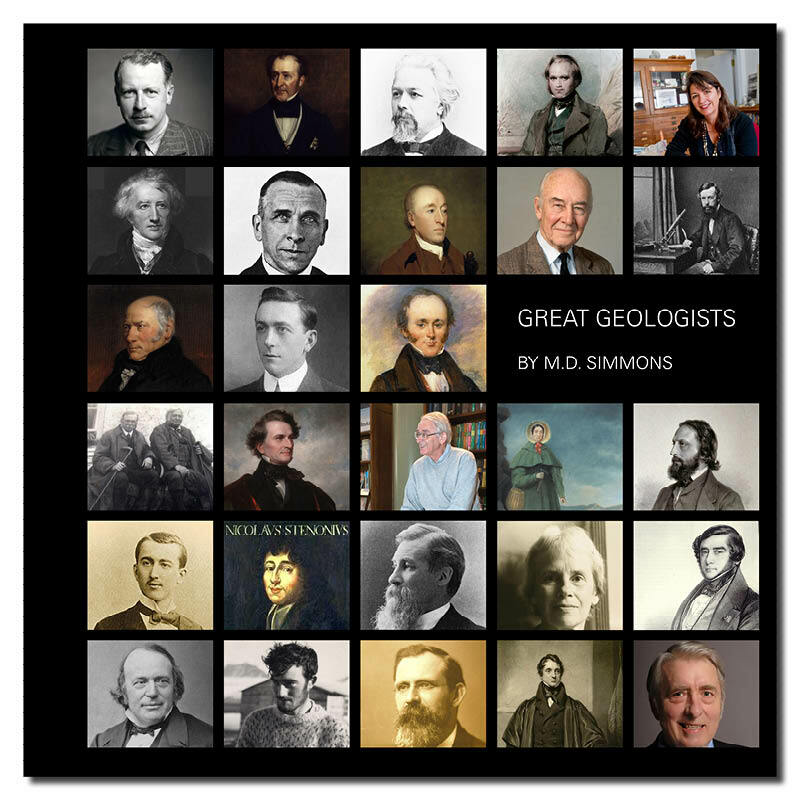 The great geologists described in this book come from very varied backgrounds. There are Victorian gentlemen scientists and polymaths; dedicated academic researchers; inspiring teachers; professional mineral and oil explorers; and enthusiastic amateurs who made breakthroughs often initially derided by the professionals. Mike brings his chosen subjects to life in brief potted biographies, each only a few pages long but full of information, summarising their lives and how their ideas fit into and helped develop the bigger picture of geological knowledge. It is very well illustrated, not just with pictures of the subjects and their work, but of important places in their lives. Each great geologist comes with a short list of references, which demonstrates the extensive reading and research Mike has put into learning about each of his subjects. This excellent book is a free gift to the geoscience community from Mike and his employers, Halliburton. It is available as a downloadable e-book from the address below. There are limited hard copies available via Mike. It is also available for loan via the Geological Society Library and British Lending Library and will be raffled by GEO ExPro at upcoming conferences.